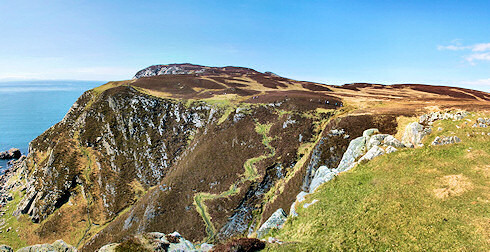 Now I said I had picked this for a reason: This morning Mark Unsworth of Islay Studios posted a picture Hill walker on the Oa on his photoblog. Well, the walker in question is me. The picture above is ‘reciprocal’, or in other words, the view the other way around. If you look closely you will spot a few walkers in a line along the cliffs, one of them is Mark, taking the picture of me on top of the cliff. With that I'm signing off for this evening, as usual I will post the larger version (larger as in more than twice as big) of this evenings Friday Islay picture on the Islay Pictures photoblog tomorrow morning. Good night!